I enjoyed Load the Boat. It had mystery, drama, romance, lots of square dancing, interesting characters and clean story. This was an enjoyable mystery that made me want to take a cruise with Darla and her square dancing friends. 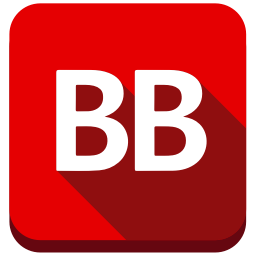 The plot was fantastic and the characters likable. I like mysteries and this is the first one that I’ve come across that involved square dancing … it sounds like a friendly close-knit community. I thoroughly enjoyed this fun cozy mystery. … a nice, fun cozy series, with fun characters, a lesson in square dancing, and a good read. Darla King left her position as a Florida investigator hoping to avoid any further involvement with law enforcement—but her curiosity keeps getting in her way. Darla is beginning to realize that what she envisioned as the simple life of a square dance caller is not so simple after all. When Darla agrees to serve as a square dance caller on a cruise, she plans on a little work and a lot of fun, sun, and romance. Her friends from Clearton Squares have the same ideas. Instead, she and her friends discover pornographic DVDs, a dead crew member, and a mysterious man with a satchel. She lands in danger, escaping with on-the-spot ingenuity. All that and Mandy, who has bad memories from a previous cruise and is getting a little too friendly with Doug. 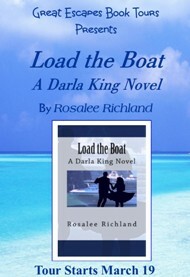 This is the second in the Darla King series and continues her adventures. Cyndi Riccio and Rhonda Brinkmann joined forces to create the Darla King cozy mystery series. Darla’s curiosity often puts her squarely in the midst of unusual circumstances, and Darla can’t let go until the mystery is solved. 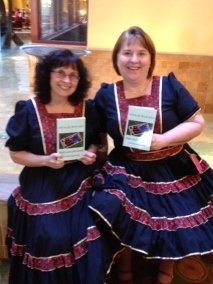 Through Darla and her friends, readers are exposed to the warmth and friendship among square dancers, as well as the enjoyment square dancing brings worldwide. 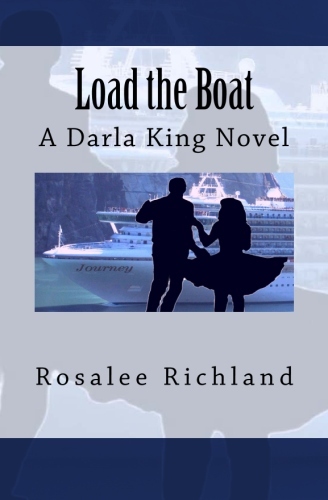 When not writing, Darla’s co-authors enjoy reading, traveling, meeting readers and fans, networking with other authors, and – of course – square dancing. Currently they are working on Darla’s next mystery and the twists and turns it will take. If you have a chance, stop in at a book signing and find out which half of Rosalee shows up! In the meantime you can stay in touch with Rosalee and Darla on on Facebook, Goodreads, or the Darla King Series blog (rosaleerichland.blogspot.com). Or just search for “Rosalee Richland” anywhere in cyberspace.